Two shots on goal for Capitals on that PP. Werenski PPG with 1;08 left in 2nd. Blue Jackets lead 4-3. This is actually the first time the Blue Jackets have played with a lead in this series. Linesman Steve Barton fell and is hurt. Seemed to be grabbing right leg. Foligno accidentally clicked skates with Barton after faceoff and his leg buckled under him. Grabbing left knee. Trainers from both teams helping Barton off. They didn't use the stretcher. They'll finish period with one linesman. 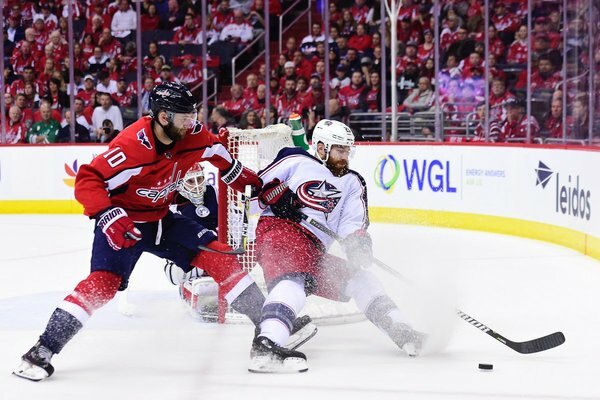 Capitals led 2-0 and 3-2 in Game 1 and Blue Jackets won 4-3 in OT. Capitals lead 2-0 and 3-1 tonight. Blue Jackets lead 4-3 after two periods. Capitals say Andre Burakovsky has an upper-body injury and won't return tonight. #Caps Andre Burakovsky (upper body) will not return to tonight’s game. Linesman Steve Barton has left the Blue Jackets/Capitals game due to injury and is being assessed by medical personnel. Garrett Rank will enter the game as his replacement. Braden Holtby leads the #Caps onto the ice for the third. He's coming on in relief of Philipp Grubauer. Braden Holtby leads Caps out for third period. Grubauer allowed four goals on 22 shots. Big save by Bob on Ovechkin alone to net. The Bob holding the fort so far for Blue Jackets. Nine saves already in first 3:56 of third period. Caps getting a PP as Calvert called for tripping Oshie. A lot of zone time for Caps on the PP. Two shots on goal. One partially blocked by Foligno. Capitals outshooting the Blue Jackets 11-0 so far in third period, 6:20 in. Bob stops Backstrom backhand from in front. Hit him in left shoulder. Chiasson deflection goes off left post.